I have been very fortunate to have a well equipped wood working shop in our basement. It has taken a long time in the acquisition mode and I have a wonderful understanding wife as well. 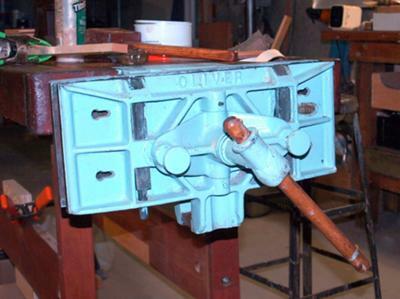 The Oliver cabinet makers vise was acquired at an auction of equipment that my firm was liquidating. At the time it was attached to a bench and I had to bid on the bench with the vise attached. The particulars on the vise include the ability to shift from a woodworkers vise to a metal worker vise by revolving the unit. It also has the flexibility to tilt upward. The jaws also adjust to allow for irregular shapes to be held. I built a bench of maple, mahogany and cherry. The unit in mounted on the end of the bench. It weighs in at about 75 to 100 lbs and it was quite a job installing it. Since I did it alone,I had to disassemble the unit and install it in pieces. It was a lucky haul which I am very proud. Join in and write your own page! It's easy to do. How? Simply click here to return to Vintage Oliver Machinery.